Patricia Cunningham, MSN, MBM, RN, was presented with Indiana's School Nurse of the Year award at the NCAA Headquarters in Indianapolis recently. Pat is the school nurse coordinator for Merrillville Schools. Pat describes herself as "very passionate when it comes to nursing, teaching, and serving the community. I love school nursing, but I love my students more. I consider my vocation as more than a job or a career; I consider it a ministry." She adds, "I do not see my students where they are today; I see my students as how they will be in the future--nurses, doctors, lawyers, and teachers." She loves former Surgeon General Joycelyn Elders' quote: "You cannot educate a child who is not healthy, and you cannot keep a child healthy who is not educated." 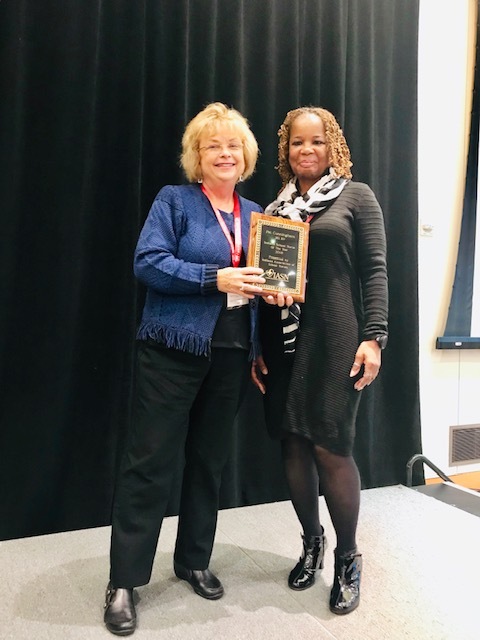 Pat was named to the IASN School Nurse Leadership Academy in 2018. Pat (R) is pictured receiving her plaque from outgoing IASN President Lynn Stoelting (L). Rebecca West was named School Nurse Administrator of the Year at IASN's annual meeting. Rebecca notes that she uses Lina Rogers as her model for school nursing excellence. Rogers focused on reducing absenteeism through education and home visits; Rebecca emphasizes the importance of education in her clinical work. She also visits home, doctors' offices, hospitals, and anywhere else her students and their families need an advocate to help them attend school regularly and safely. Some of Rebecca's other accomplishments include: implementing electronic IHPs, automatic bus notification system for students with IHPs, improved safety mechanisms for identifying students who take medications at school and for those with life-threatening allergies. Rebecca obtained her national certification in school nursing this year and encourages her peers to pursue certification--"If I can do it, you can do it." She is working with her nursing team this year on social determinants of health and clinical outcomes. 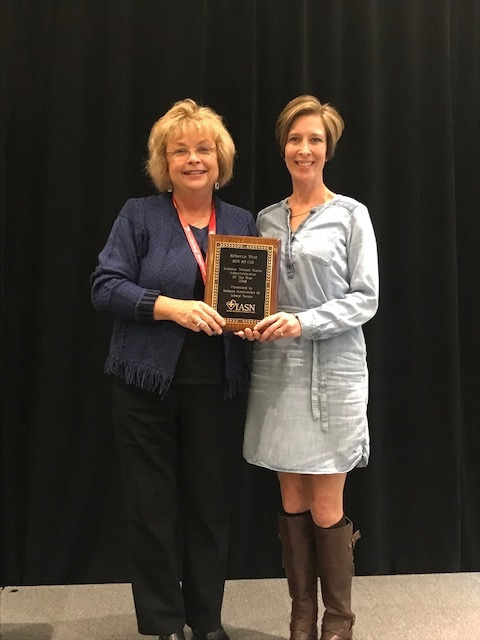 Rebecca is pictured below (R) receiving her plaque from IASN's outgoing President, Lynn Stoelting (L).